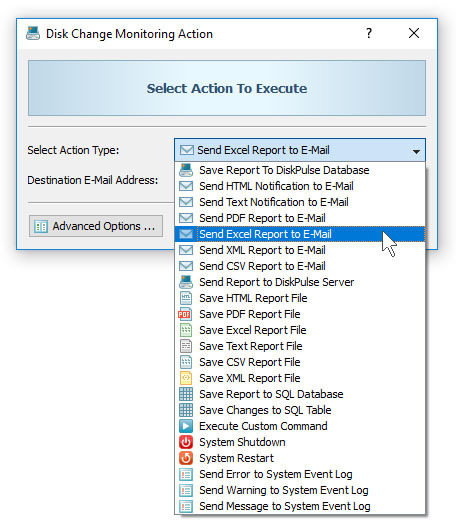 In addition to E-Mail notifications, DiskPulse provides the ability to automatically save disk change monitoring reports when a user-specified number of changes detected. In order to configure automatic report generation, open the monitoring command dialog, select the 'Advanced' tab, enable disk change monitoring actions, press the 'Add Action' button, select an appropriate report format and specify a file name or a directory name to save reports to. If a file name is specified, DiskPulse will always save reports to the same file and this file will contain the last X file system changes according to the user-specified configuration. If a directory name is specified, DiskPulse will automatically generate report file names including the report date and time for each new report file. 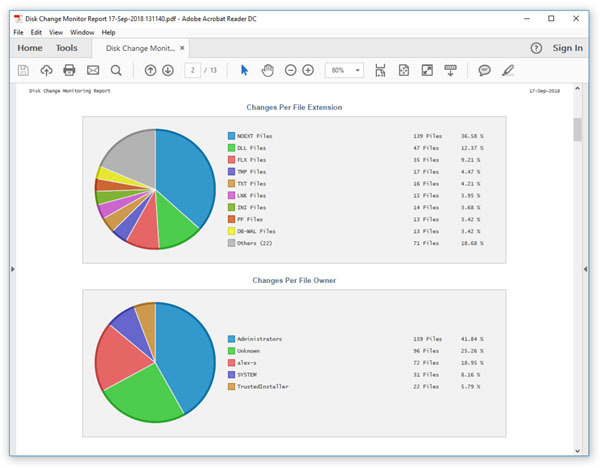 DiskPulse provides a variety of report formats including HTML, text, Excel, CSV, XML, PDF and the native DiskPulse report format, which may be used to backup a history of detected file system changes, submit reports from multiple servers to a centralized SQL database and then perform advanced search and analysis operations.